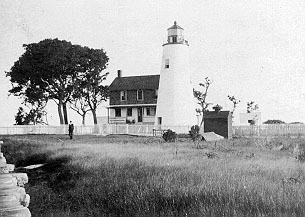 Watts Island Lighthouse was built in 1833 on Little Watts Island, a seven-acre island, just south of Watts Island between the Eastern Shore peninsula and Tangier Island. In 1867, John Donohoo of Havre De Grace, Maryland built a 48-foot tower to replace the first lighthouse. It had a fifth order Fresnel lens. The keeper’s quarters, at 20 by 34 feet and built at a cost of $4,775, were added in 1891. The lighthouse was automated in 1923. A storm in the winter of 1944 toppled the tower and the island has completely eroded away. Today, only a shoal exists where the lighthouse and island once stood.